Just as brick and mortar stores change their merchandising displays every few weeks, it's important for online stores to update their layout as well. Adrecom's eCommerce portal "Back-End" has all the tools you need to keep your storefront dynamic and interesting for your customers. Engage customer interest and encourage repeat visits by regularly changing the products presented on your homepage. Online-store maintenance is critical to continued success. 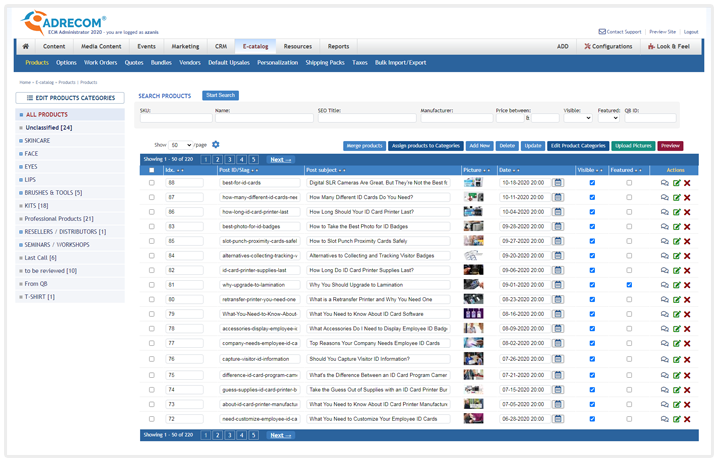 Give customers up-to-date information at a glance with thumbnail views before they click for more detail. Enable them to find exactly the products they want via search. Create dynamically changing images that show items customized by customer preferences, giving the customer every way possible to find additional items. Template, store front and landing-page layout repository. Multiple store-front skins management with archiving. Media repository with asset categorization, re-use, and archiving. Bulk media upload, thumbnail views, and meta-data assignment. Each set of "Smart tags" enable easy functionality and navigation configurations. Built-in WYSIWYG editor for dynamic pages composing and editing. Built-in multilingual and multi-currency support. Rules-based back-end access permissions configuration. Template and layout authoring through dynamically changed navigation, images, graphics, text, and video placement. Major payment-processor support (Paypal, PayPalPro, Authorise.net, Linkpoint, NMI, Transfirst ). Customer-configured shipping, including vendor-chosen flat-rate and destination-table based shipping. Real-time calculation of freight costs - integration with USPS, FedEx, UPS, DHL. Contact-, feedback-, and inquiry- form configuration. Auto responders, confirmation messages, notifications, alerting, invoicing, and tax setup. Customer, distributor, and affiliate accounts. Setup of default commissions, and quantity and amount discounts. Unlimited number of product categories and stock-keeping units (SKU's ). Unlimited number of product property fields. Product assignment to multiple categories. Support of prime (master) and accommodative (children) categories. Product kits, bundles, and configurable products. Downloadable products with licensing terms. Multiple product images and related video. Article, news, podcast, and blog post association with products. Product options management, global options - category based and products based. Unlimited product-options configuration -e.g., size, colors, packaging. Related products and associated accessories. Total SEO control - URLs, titles, keywords, meta descriptions. Bulk product-catalog export and import. Product activation and de-activation by sales channel and geographic availability. Quantity, amount-based, percentage-based, and purchase-limit discounts. Product-and-Category-based up sales and cross sales. View-card and check-out up sales. Different pricing assignment for retail, wholesalers, and affiliates. Built-in inventory management, including inventory allocation in near real time. Categorized-content repository with rich media support such images, PDF files, flash, audio and video. Bulk meta-data upload - keywords, meta descriptions, customizable and searchable fields per products or content items. Article and testimonial assembly, editing and publishing. Promo codes per product group, date, brand, product category. Promo codes for sub-total, max and min amounts, and quantity discounts. Amount- and quantity-based discounts and free shipping. Promotion per customer type, special events, and ordering method. Email subscription and mailing-list management. Customers email segmentation for personalized offering and email export automation. Gift certificate and gift registries. Affiliates program management with private-labeling configuration capability. Built-in product-feed submissions to Google Base. Ready-to-go product-feed generation to ChannelAdvisor. Built-in before and after management with product assignment. Brand, category, product group slide shows and carousels. Product assignment to reach media galleries. Real-time order processing and credit card authorization. FedEx, UPS and USPS, vendor-selected shipping integration. Shipping tracking and shipping-label generation. Centralized management of online, phone, and Amazon orders. Built-in web services and XML-based integration with 3rd-party fulfillment, ERP, and CRM systems. Automatic orders and customer-account integration with Intuit QuickBooks and Sage ACT. Purchase-order management and invoice payment with credit cards. Create, store and share quotes with customers. Purchase order reordering with auto-fill customer-account information. Purchase order download in PDF and custom shipping methods. Purchase order creation by multiple-products selection from product catalog. Customer registration, profile management and maintenance. Customer accounts with order history, tracking, address-book management. Built-in Contact and "Request More Information" forms and site wide messaging. Customer-services portal and online communities. B2B buyer approval with multi-tier pricing levels and payment terms grouping. Integration with Liveperson online chat system.